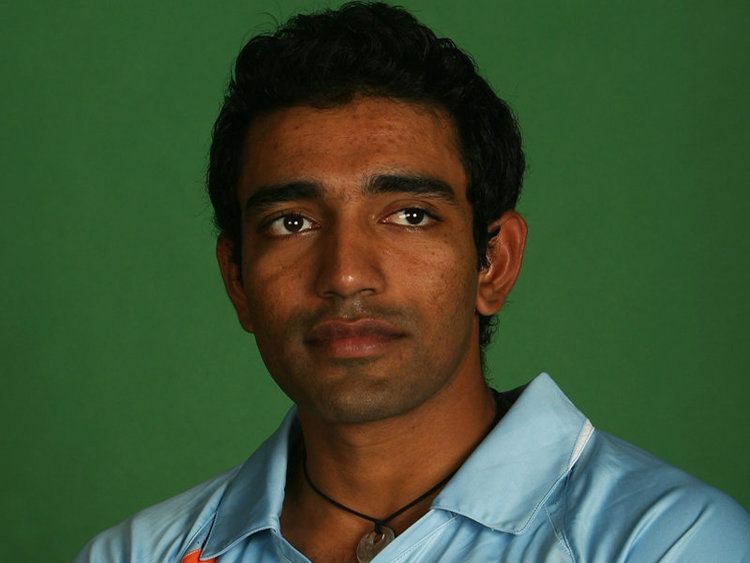 Robin Venu Uthappa ( pronunciation ; born 11 November 1985) is an Indian cricketer. He plays for Karnataka in domestic cricket and Kolkata Knight Riders in the IPL. Uthappa made his One Day International debut in the seventh and final match of the English tour of India in April 2006. He had a successful debut, making 86 as an opening batsman before being dismissed run out. It was the highest score for an Indian debutant in a limited-overs match. He is nicknamed 'The Walking Assassin' for his tactic of charging the bowler. He played an important role in India's win at the 2007 ICC World Twenty20. He finished the 2014–15 Ranji Trophy season as the highest run scorer that season. Uthappa was born in Kodagu in Karnataka, India. He received his education at Sri Bhagawan Mahaveer Jain College which comes under the umbrella of Jain University, Bangalore. At a very young age, he has shown the signs of fulfilling his potential. Uthappa first came to the public's attention when he made 66 for India B against India A in the Challenger Trophy in 2005. The following year, in the same tournament, Uthappa made match-winning 93-ball 100 against the same team which propelled him in the big league. Previously, he had been a member of the India Under-19 team that won the Asia Cup. Once a wicket-keeper batsman, his List A batting average of near 40 with a strike rate of approximately 90 has made him regarded as something of a limited overs cricket specialist. He was recalled to the ODI side in January 2007 for the series against the West Indies. He did not feature in the first two games. He scored a quick 70 in the third game followed by a quickfire 28 in the fourth game. He was selected in the 15-member squad of the Indian team for the 2007 Cricket World Cup held in the West Indies in March–April 2007. He played in all three group games, but only scored 30 runs in total as India suffered a shock defeat to Bangladesh and a loss to Sri Lanka resulting in the team not qualifying for the Super 8 stage. In the sixth ODI of the NatWest Series 2007–2008, he scored 47 off 33 balls to take India to a thrilling victory, keeping Indian hopes alive in the 7- match series which they were trailing 2–3 before the match. Used to batting as an opener, in this match he came in at the unfamiliar position of no 7. When he came at the crease India were 5 down for 234 after 40.2 overs, still needing 83 from less than 10 overs. After Dhoni got out in the 47th over with the Indian score at 294, Uthappa kept a cool head to take India to the target with two balls to spare in a remarkable victory. Uthappa also scored a crucial 50 against Pakistan in the 20–20 World Cup in South Africa, when India were tottering at 39/4. With this, he became the first Indian to score a 50 in a 20–20 International match. India subsequently won the match in bowl out 3–0, where he bowled one of the three deliveries that hit the stumps. After his impressive performance in the seventh season of IPL, he was selected to captain the India A team for its tour of Australia in July 2013. In November 2014, Robin was included into Indian One Day International squad for the last two matches against Sri Lanka. Uthappa played for Mumbai Indians in the 2008 Indian Premier League and had a fairly successful opening season. In his very first match he scored 48 runs from 38 balls against Royal Challengers Bangalore. In the next game, against Chennai Super Kings, he made 43 (36) including 6 fours and a six. Against Kolkata Knight Riders, he stitched an unbeaten 123-run partnership with Dwayne Bravo, where he scored a run-a-ball 37 to steer Mumbai to an easy win. Then he scored 34 off just 21 deliveries to lead Mumbai to an emphatic victory over the in-form Rajasthan Royals. However, a quickfire 23-ball 46 from Uthappa went in vain after Delhi Daredevils clinched a 5-wicket win in a nail-biting finish. 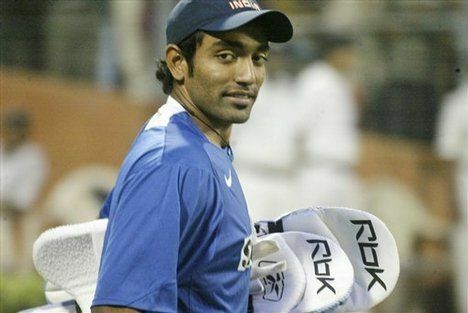 In January 2009, he was swapped with Zaheer Khan and moved to Royal Challengers Bangalore. He had a disappointing 2009 season of IPL for the Royal Challengers. His only noteworthy innings came against the Mumbai Indians in a match where he struck 66* off 42 balls to guide the RCB run-chase. In a match against Kings XI Punjab in 2010 Indian Premier League he smashed a 21-ball 51, the second fastest fifty in Indian Premier League and was instrumental in setting up the win for the Royal Challengers. He came up with another match-winning innings, against Chennai Super Kings, as he struck an unbeaten 68 off just 38 balls. He also won the Man of the match award for this effort. Against Kolkata Knight Riders, he scored an unbeaten 50 from only 22 deliveries to take the Challengers to another comfortable win. He ended the season with 374 runs from 14 innings at an average of 31.16. He also hit 27 sixes, which was the most by any batsman in that season. For the 2011 Indian Premier League he was bought by Pune Warriors for a huge sum of 2.1 million USD (approximately INR 9.4 crores) in the auction held at Bangalore. He was the second most expensive player in that auction behind Gautam Gambhir, who was bought for 2.4 million USD by Kolkata Knight Riders. According to Bangalore Mirror, Few Days before the start of Champions league T20 Robin Uttappa convert to Roman Catholicism at the Holy Ghost Church in Bangalore. Bernard Moras, the Archbishop of Bangalore presided over and conducted the ceremony. Even though IPL 5 was a disappointing one for Pune Warriors India, Robin Uthappa remained their top scorer scoring 405 runs from 16 games, which included a blistering 69 against the RCB. The same happened in Season 6 of IPL, although team's performance was poor, Robin Uthappa managed to score 434 runs in 16 matches. For the seventh season of IPL, he was drafted in by Kolkata Knight Riders. He failed to perform well in first leg of the tournament conducted in UAE. He was then promoted to the opening position with Gautam Gambhir and performed well in the India-leg of the season. He won the Orange Cap, given for scoring most runs in the season, 660, and in the process created a T20 record for having scored 40+ scores in 8 consecutive games. He eventually made 11, breaking the record held by Mathew Hayden of most 40+ scores in a single season. In 2014 he set a world record by posting 40+ scores in 10 consecutive innings. 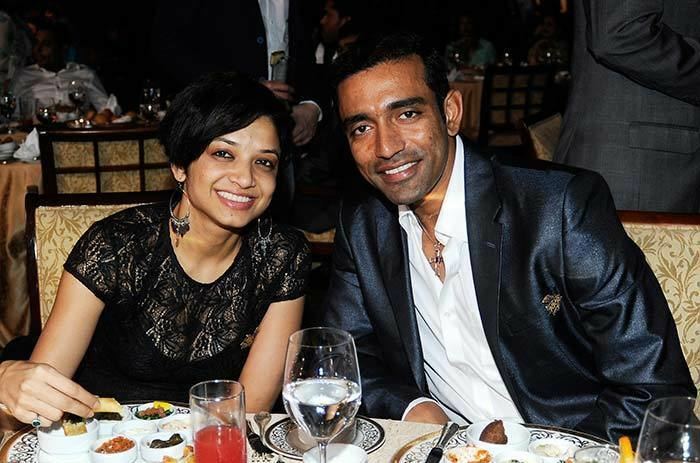 Robin Uthappa is half Kodava by ethnicity. Religiously, he is a Christian, like his mother Roselyn and sister Sharon. His mother Roselyn is a Malayali. 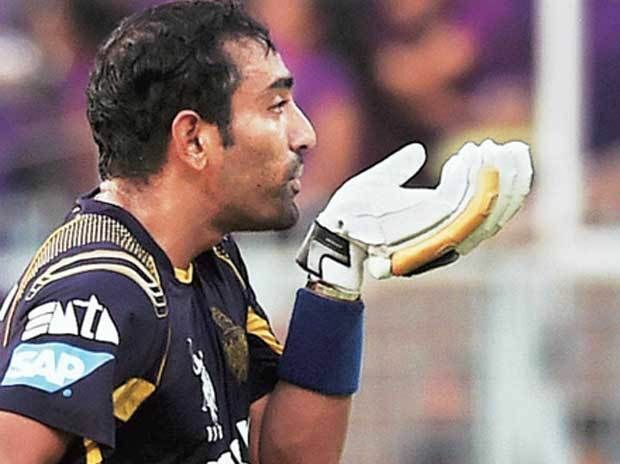 His father, Venu Uthappa, a former hockey umpire is a Kodava Hindu. He married his long-time girlfriend Sheetal Gautham on March 2016.